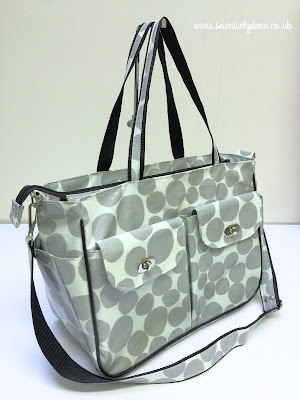 There are times when you are making your bag(s) and you just cannot, for the life of you, find materials perfect enough to make the handles or the straps to finish your bag off. Not only can this be frustrating, but at times, little niggly bits like this can make or break your projects. 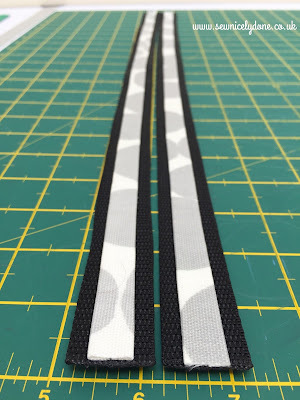 I would love to share with you how I make my own personalised carry handles and straps. Super simple, and super quick and also quite fun. If you'd like to know more, please continue reading. 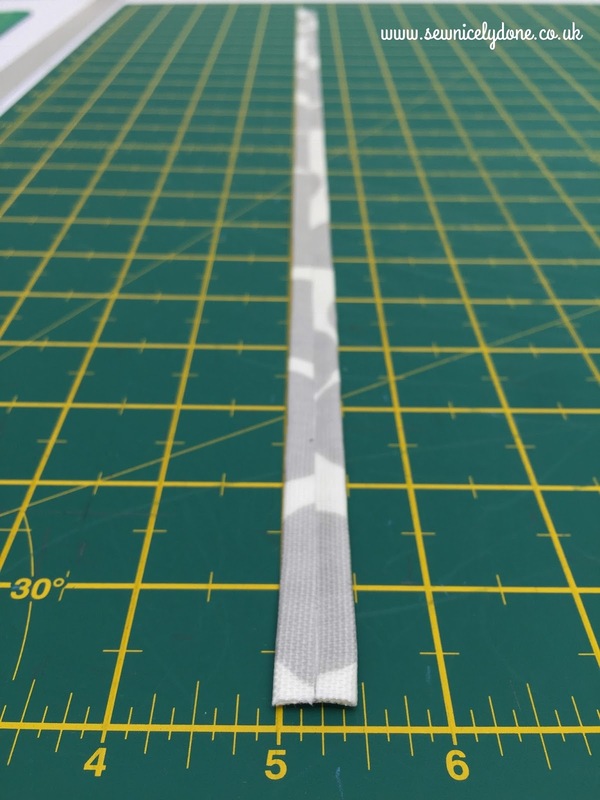 Main material - Polypropylene webbing or cotton webbing. 1. 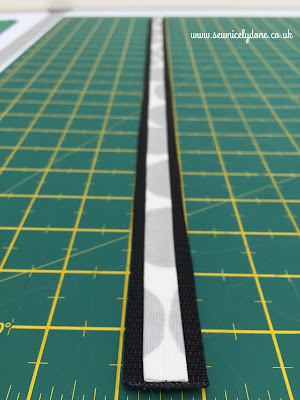 First, determine the desired length of your polypropylene or cotton webbing straps. 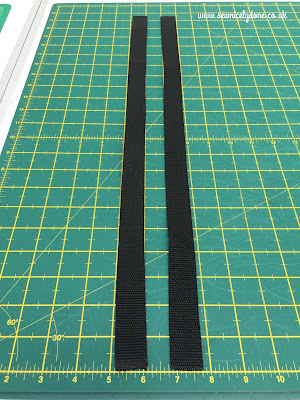 I have mine cut at 21.5 inches long and these are 1 inch wide straps. * I zig-zagged the ends of my polypropylene webbings to prevent them from fraying. 2. Cut your secondary material to add to your webbing. I chose oilcloth for mine. This material can be anything - oilcloth, vinyl, leather, ribbons etc. 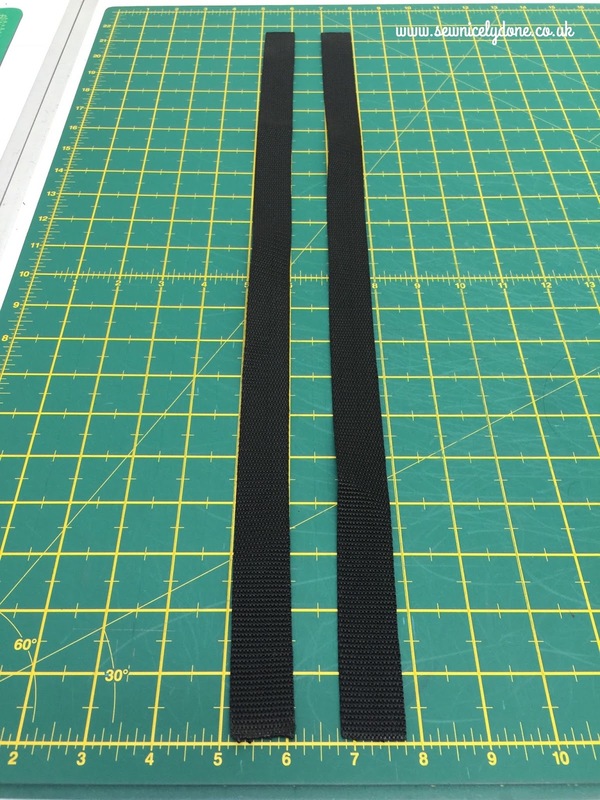 The material needs to be exactly the same length and width of your webbing. 3. Fold the secondary material in half to determine the centre then fold both long sides inwards, towards the centre, wrong sides together. 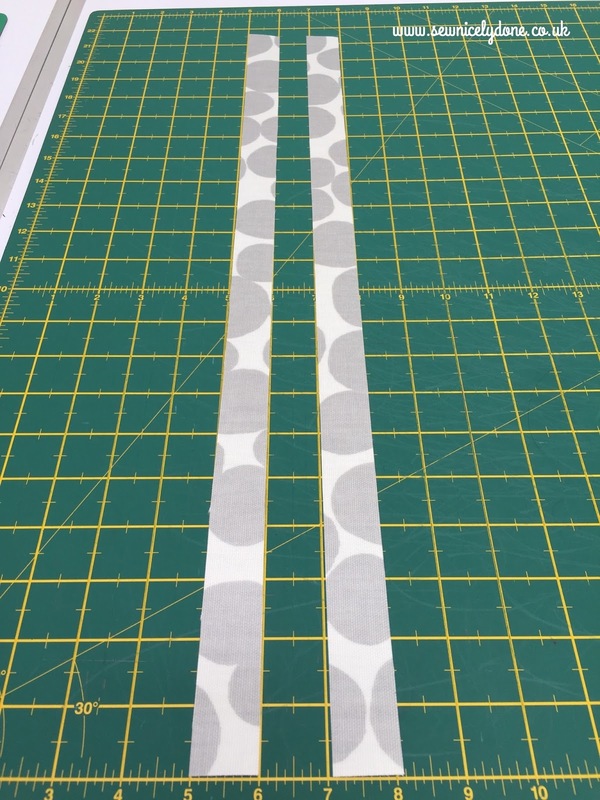 At this point, the secondary material will be half its width. 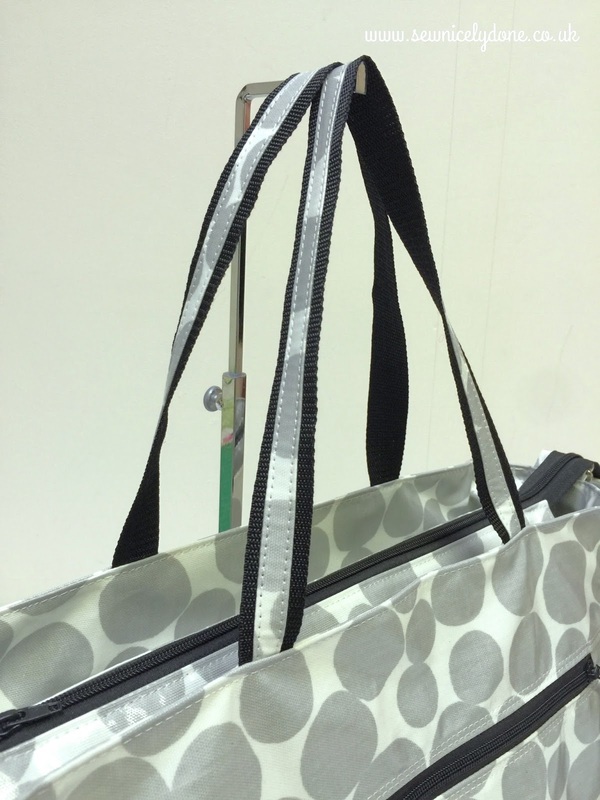 You can secure the folded material with foldback clips or quilters' clips. I used double sided tape to hold mine in place. 4. Centre your secondary material on your main material as shown in the picture. I eyeballed mine but if you are a stickler for perfection, feel free to get your measuring tape out. Again, you can use foldback clips or quilters' clip to hold it in place. I used double sided tape. 5. 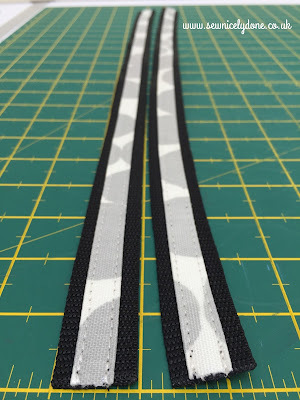 Do this to both straps. 6. 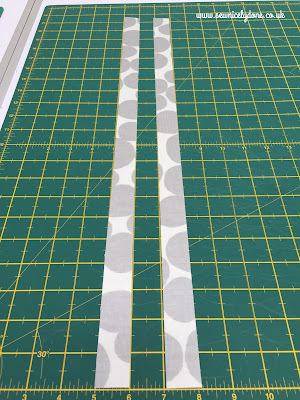 To finish them off, just sew the secondary material in place onto your main material. 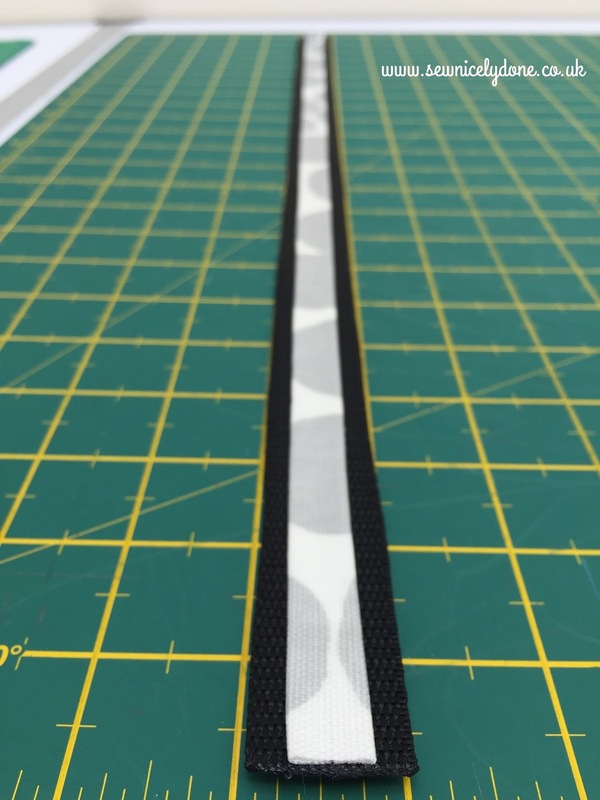 I used a 1/4 inch seam allowance here. 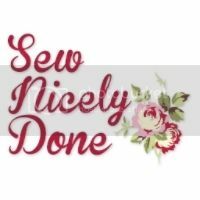 You can also use 1/8 inch seam allowance but I prefer to show my stitches off. Something to bear in mind here is your choice of thread. I use white as my upper thread and black for my bobbin thread to match my webbing and my oilcloth. 7. All you do now is finish off your project(s) with your handmade personalised straps. They don't look too special on their own but when added to your project, they make such an impact for a perfect finish. I also made a matching personalised long shoulder strap to match the carry handles. I love how you could lift a simple design with such little effort. I hope you find this tutorial useful. Good luck lovelies!